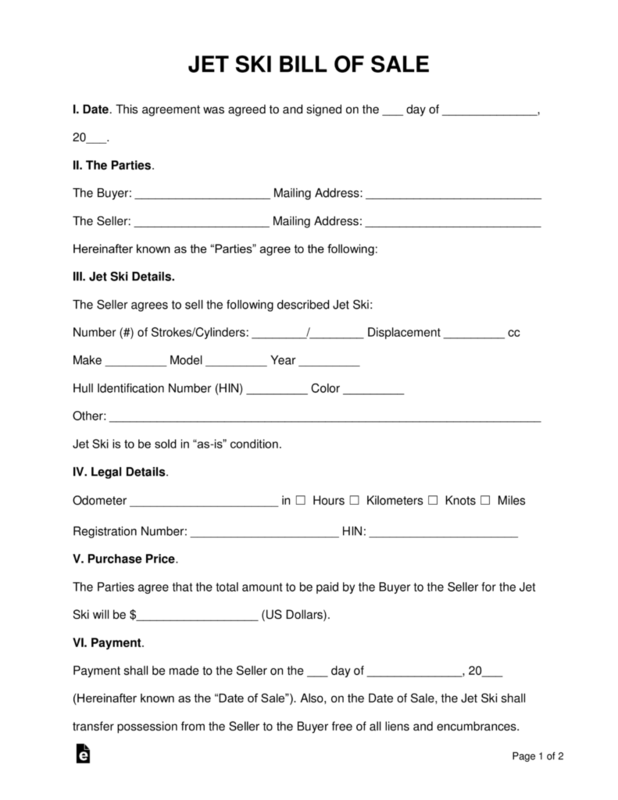 A Jet Ski Bill of Sale is a legal document that outlines the purchase and sale of two (2) parties negotiating the terms of an agreement to buy/sell a Jet Ski. Usually the buyer will ask to have the jet ski inspected by a certified technician. The seller may request a deposit be made on the watercraft and pending approval will the sale proceed. The buyer acknowledges that they are purchasing the jet ski in “as-is” condition and any repairs or defects found after the date of sale will not be the liability of the seller. When Do I Need to Use a Jet Ski Bill of Sale? The Jet Ski Bill of Sale is required for any sale, gift, or exchange involving a jet ski. 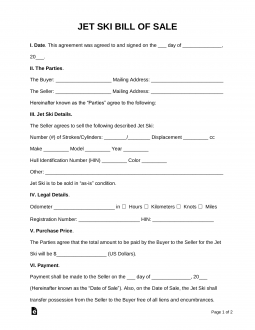 This form acts as proof of purchase by the buyer and helps protect the seller from any liability after purchase. It is usually used for private, as-is sales between a previous owner and a new one. Since there is no dealer operating the sale, it’s important to have this document on record to protect both the buyer and the seller. How Do I Sell My Jet Ski? Selling a jet ski is just like selling any other recreational vehicle or equipment. But just in case, here’s a step-by-step guide for you to follow. Before you can sell your jet ski, you’ll want to ensure it is in top condition. Make any necessary repairs that you’ve been meaning to get to. It’s always inviting to buyers to be able to buy a jet ski that’s ready to go at time of purchase. They’re more likely to pay more for a fully functional jet ski than one they have to repair themselves. Once your jet ski is ready for sale, have it appraised or come to terms with a price you want to advertise. Then post your jet ski in online ads and/or the classifieds. Of course, buyers are going to want to haggle for your jet ski. Be willing to work with them a little bit. Know where your price line is and settle with the buyer willing to offer the most. If no one is willing to buy your price, then reconsider the worth of your jet ski. Make sure you’re not trying to oversell it. You may also have to advertise elsewhere to get the price you want. After you settle with a buyer, it’s time to fill out the Jet Ski Bill of Sale. Make sure that the title is clear of any encumbrances or liens before entering in the transaction. The next steps is to have the buyer put down the security deposit determined on the bill of sale and perform an inspection of the jet ski. The inspection is often done by a certified technician. If everything clears with the inspection, then you are ready to finalize the sale. To finalize the sale, the buyer needs to complete the payment agreed to in the bill of sale. The seller then needs to transfer the title and registration to the new owner with the jet ski. And that’s it—you’ve sold your jet ski. As an important reminder, make sure to keep a copy of the bill of sale in case of any future disputes. This document is proof that all sales are final and that the buyer is responsible for any issues with the jet ski.